This great little product may seem unnecessary, but it will grow on you! I recommend the Hiker Wallet to anyone that goes into the backcountry that doesn't want to carry their big heavy wallet! Okay, I admit it—this was an impulse buy! But I am happy that I bought it! 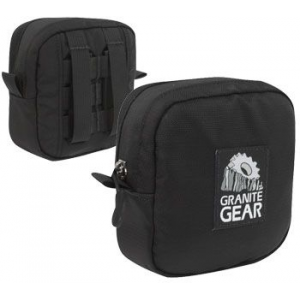 This is a great little product from Granite Gear that I have been using for several years now. It's one of those things that isn't really necessary, but you'll be glad you have it. After I purchased it, I thought "Well this is silly. I don't really need this." But over the years, I've realized its worth, and it has become one of those items that goes with me on every backpacking trip. Face it—the wallets we all use everyday are full of stuff that just isn't needed (or wanted) in the backcountry. So having something minimalist like this, is a good thing. 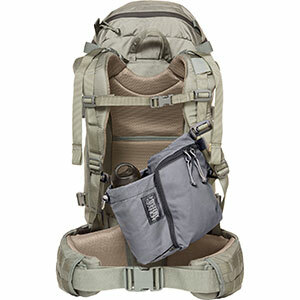 From an organizational perspective, it's great for holding just the few things you want to have with you, without losing them somewhere in your pack. It is plenty big enough for a drivers license/I.D. 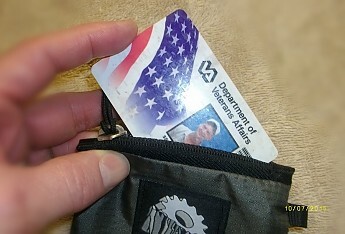 card, a credit card, some money, backcountry use permit, fishing license, etc., etc. Personally, in addition to my D.L., insurance I.D., and check card, I also put my extra truck key in it, so I don't have to bring all of my keys with me. 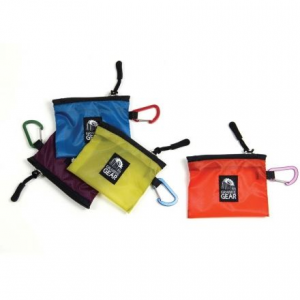 It is a very simple design, just a little 4" x 3" pouch with a zipper. And some kind of little "loop" of fabric on one end for... A wrist strap, maybe? 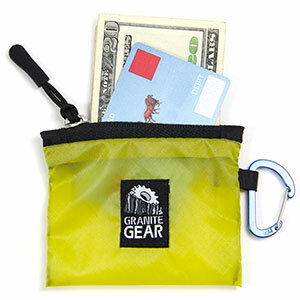 Well, I just checked Granite Gear's website, and they show mini-carabiners hooked to that loop of fabric! 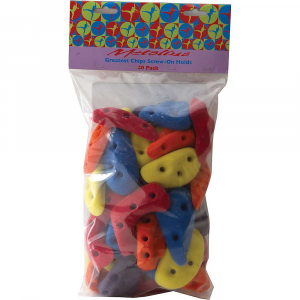 The material is not listed on their website, but it seems very similar to what tent walls and stuff sacks are made of. But I highly doubt that it is waterproof, and Granite Gear makes no such claims. 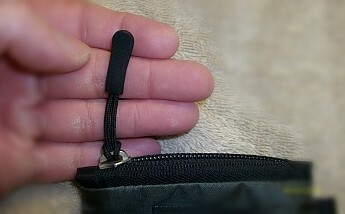 It has a larger than expected zipper pull for such a small item. But I see that as a plus. ... you have to put them in at an angle. That's hardly even a minor inconvenience, compared to the benefits. I didn't even think of this! 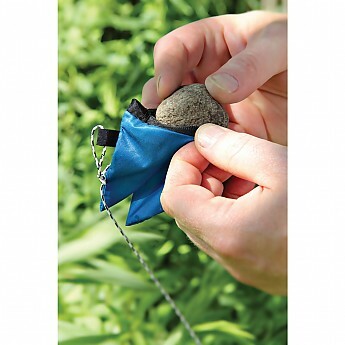 You can use it as a rock bag for throwing your bear bag line over a tree limb! See? This little piece of "unnecessary" gear is starting to look better and better all the time! 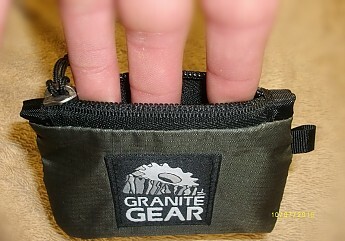 So there you have it—the Granite Gear Hiker Wallet. You know you want one now! They cost like 10 bucks! What are you waiting for? Fairly often when I pack my things into a ziplock I think I should get something like this, but then never actually get around to doing so. So, thanks for the reminder, DLK37086. 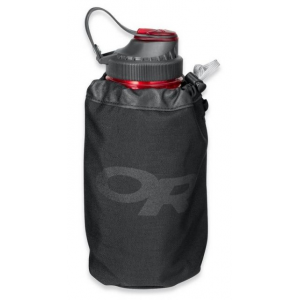 It would be nice to find a waterproof option also. 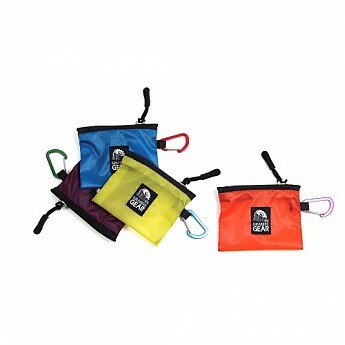 You'll be needing a bigger wallet for all of the big bucks to be made in a waterproof one! Alicia- LOL!! Nah, that extra money would fly out of my wallet... for more new gear! 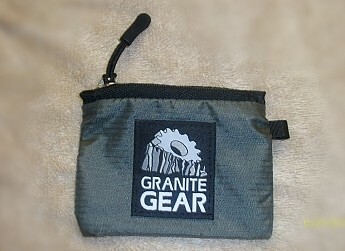 The Granite Gear Hiker Wallet is not available from the stores we monitor. It was last seen March 28, 2017	at SunnySports.